The stove door completes the front of the unit and overlays the glass, creating the desired appearance. Stove side doors accent the left and right of the stove body, giving the desired end appearance. A log set will complete the look of the gas fireplace, offering a life like appearance and effect. Are you having trouble finding parts for your direct vent stove? Still not sold by company products? Kingsman provides customers with a multitude of options when it comes to finding the right part. Not only does Kingsman provide customers with a variety of options, you can rest assured that these products are made to be durable and affordable. The Kingsman ZDVDKA Dura-vent stove adapter is used specifically with direct vent stoves and allows the ventilation to exceed expectations when comparing them to other vents. With a Dura-vent from Kingsman, you will never have to worry about your living room being filled with polluted air. This vent pipe is designed to direct vent propane stoves, natural gas stoves, heaters and fireplaces. The inner wall is made from .020 aluminum. The outer wall is 26 gauge galvanized steel. The pipe features twist lock connections that give you a great installation with having to use fasteners. This pipe features a sleek black finish. This product is made by Direct Vent Pro and has a limited lifetime warranty. This DuraVent Pro extension can be used when you need a little extra length but don't need an entire section. Like other DuraVent Pro components. , this one has a 0.020" aluminum inner wall and a 26-gauge galvanized steel outer wall and can be used with most direct vent appliances. This piece has a 4" inner diameter with a 6-5/8" outer diameter and it comes with a sleek black finish. No fasteners are needed for connection because a twist lock system is used. This piece is compatible with other DuraVent Pro components. and comes in lengths of 8" and 16". A limited lifetime warranty applies. If you're in need of a replacement DirectVent Pro black vent pipe, you've come to the right place. This DirectVent pipe is adjustable, and has a 4 in. inner diameter, and 6 5/8 in. outer diameter. 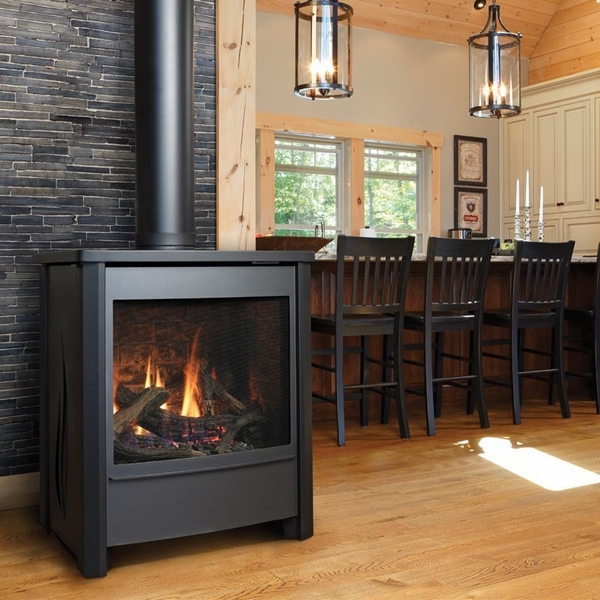 You'll find this pipe efficiently vents direct vent gas or propane stoves, heaters, and fireplaces, and Dura-Vent's Twist Lock technology allows for connections that provide a secure installation without fasteners. These pipes are constructed with a .020 aluminum inner wall and 26 gauge galvanized steel outer wall for long life and durability, and the sleek black finish makes it an attractive and viable option for any heating appliance ventilation system. 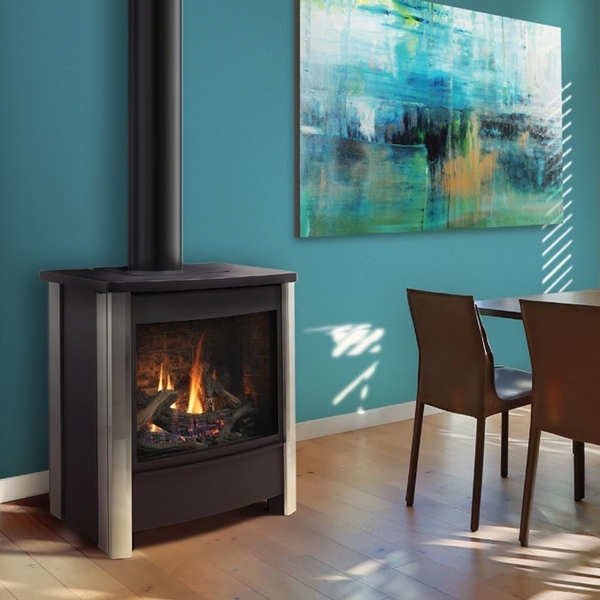 Duravent has designed an efficient vent for gas or propane stoves, heaters, and fireplaces that was constructed with the economic consumer in mind. This vent has been constructed with the most durable .020 aluminum inner wall and a 26-gauge galvanized steel outer wall. Twist lock connections provide secure installation without fasteners and an unsurpassable galvanized finish. DirecVent Pro can satisfy the practical and aesthetic demands of any installation with the option of a sleek black finish or a modern galvanized one. DirectVent Pro knows that sometimes you will need to extend the vent of your fireplace away from your roof. The possible reasons for such a procedure are numerous, but in the end, you need a viable choice regardless of the reason. The Dura-Vent Galvanized Vent Pipe Extension comes with a 4 inch inner diameter and is able to provide you with the resources that you need to make sure that all of your objectives are attained. This galvanized vent pipe is adjustable. It is to be used with direct vent natural gas or propane stoves, heater and fireplaces. The inner wall is made from .020 aluminum and the outer is made from 26 gauge galvanized steel. The inner diameter measures four inches and the outer diameter measures 6 5/8 inches. The secure twist lock feature means it connects easily with other components. with same twist lock feature. There is only some twisting required. Venting direct vent gas or propane stoves, heaters, and fireplaces has never been easier or more reliable than with this Dura-Vent DirectVent Pro Galvanized 12-Inch Vent Pipe with 4-Inch Inner Diameter. The 26 gauge steel outer wall ensures that this pipe will last for years to come and the twist lock connections enable you to make a secure connection without any fasteners. The Dura-Vent Vent Pipe is compatible with most direct gas appliances, making it the universal choice when it comes to all your vent pipe needs. When it comes to installing a chimney in your home, you must make it a top priority to get the best available equipment. Since you want to make sure that your possession will have a long life, you must get the best tools to insure it has that chance. With the Dura-Vent DirectVent Pro Galvanized 24-Inch Vent Pipe with 4-Inch Inner Diameter - 46DVA-24 you have a pipe that can be installed with the greatest of ease and will last for as long as you could possibly want. This Dura-Vent DirectVent Pro Galvanized 36-Inch Vent Pipe - 46DVA-36 has a 4 in. inner diameter, and 6 5/8 in. outer diameter. The pipe is constructed with a .020 aluminum inner wall and 26 gauge galvanized steel outer wall for strength and durability and is approved for use with most heating appliance ventilation systems. This pipe efficiently vents direct vent gas or propane stoves, heaters, and fireplaces and Dura-Vent's Twist Lock technology allows for connections that provides a secure installation without fasteners. Venting direct vent gas or propane stoves, heaters, and fireplaces is easy with the Dura-Vent DirectVent Pro Galvanized 48-Inch Vent Pipe with 4-Inch Inner Diameter - 46DVA-48. This pipe is made with a 26 gauge steel outer shell which ensures durability, and the twist-lock connectors give you a solid connection without fasteners. This vent pipe is compatible with all DirectVent Pro products, and is able to work with most direct vent appliances. Make your piping project quick and secure with this Dura-Vent DirectVent Pro vent pipe. This handy DirectVent Pro vent pipe swivel elbow by DuraVent allows You to offset venting obstructions with ease. When You attach this elbow to Your pipe, simply swivel it to align this user-friendly component. This swivel elbow is intended for use with 4 in. inner diameter DirectVent pipe and is made of durable aluminum and galvanized steel construction, and the simple Twist-lock connection technology eliminates the need for pop rivets and screws. The inner wall is constructed with .020 in. aluminum, and the outer wall is made of 26 gauge galvanized steel. This efficient product will offset any potential venting obstructions that may occur within Your venting system. This design is also vents direct vent gas or propane stoves, heaters, and fireplaces so that Your home can experience optimal heating effects. Constructed of the most durable material, this model comes with a .020 aluminum inner wall and 26-gauge galvanized steel outer wall, 4" inner diameter with 6 5/8" outer diameter, and the convenience of twist lock connections provide secure installation without fasteners. Installing a direct vent chimney through a combustible wall is simple with this Vent Pro vent pipe wall thimble by Dura-Vent. This chimney pipe thimble acts as a wall pass-through and firestop for direct vent piping for vent pipes with a 4 in. inner diameter. This thimble is intended for use with Direct Vent Pro horizontal high wind rain caps and is constructed from .020 in. aluminum inner wall, and a.018 in. galvanized steel outer wall. A framed 10 in. opening is require for installation. The Dura-Vent Round Ceiling Support and Wall Cover is the perfect item for anyone wanting to install a direct vent system without ugly and unsightly ceiling holes. This attractive DuraVent ceiling support in insulated to prevent air leakage and provides the pipe support for flat ceiling direct vent installations. The black design also gives the DureVent round ceiling support a finished, smooth look. Make installing your direct vent system easy and appealing with the Dura-Vent Round Chimney Ceiling Support and Wall Cover. DirectVent Pro Heat Shielding Standoff provides protection for your vinyl siding when you are installing a horizontal vent without fear of warping or melting the siding. This Shield, manufactured by Dura-Vent is compatible with all DirectVent Pro venting products and is made with .020 in. aluminum inner wall, and .018 in. galvanized steel outer wall. The painted outer walls are made of laser welded .018 in. galvalume steel. This standoff is made for 4 in. inner diameter chimney pipe. Keeps moisture and debris out of the liner system, preventing costly clogging or corrosion over time, and ensure your chimney liner lasts for years to come with this DirectVent Pro 4 Inch Diameter x 6-5/8 Inch High Round Horizontal Rain Cap from Dura-Vent. This rain cap provides an attractive alternative for side wall terminations of direct vent installations. It is designed for compatibility with other DirectVent Pro pipes and components with a 4-inch inner diameter. Everyone knows that without the proper protection against the effects of rain, sleet, snow, and hail, even the best-constructed vents systems are subject to deterioration and decline. DuraVent has designed a rain cap made of the most durable aluminum that can dispense the strongest defense against rain, snow, and even high-powered gusts of wind. Maintain the reliability and use of your venting system for years to come when you purchase and implement this efficient design. DirectVent Pro has designed Dura-Vent Galvanized Vent Pipe Ceiling Firestop to make the process of running a chimney through your attic and roof top to be one that is not only straightforward but also very easy to accomplish. It is specifically designed for vent pipes with a 4 inch inner diameter and is able to make sure that everything is safe and secure so that you can have peace of mind whenever you decide to sit back and relax in front of your chimney. When a direct vent pipe must pass through a ceiling, it requires a ceiling support box that serves as the bottom support for the entire installation. This support box has an adjustable feature that allows it to be used with either cathedral or flat ceilings. It has a black finish and comes complete with the required clamp and trim pieces to create a smooth and finished transition. It is approved for use with most direct vent appliances and is compatible with DirectVent Pro products. It carries a limited lifetime warranty. The part has a 6-7/8" opening and has external dimensions of 14" H x 10 5/8" W x 10 5/8" L.
Creating stable vents for your vent installation is important if you want to minimize the stress that your piping is subject to. With this support strap, you can support pipes that are 4 inches in diameter, and create a more stable environment for your vents. With this support, you can minimize damage and stress due to incorrectly installed pipes or pipes subject to additional pressure, and you can keep your pipes working like new for longer. Roof flashing around your chimney vent protects both the vent pipe and your home from water and is essential to a good top termination. This flashing is made of durable galvalume and is compatible with the DirectVent Pro venting system. It has a 6-5/6" pipe opening and is appropriate for use on 4" DirectVent Pro chimney pipe. The part is adjustable but can be ordered in two different roof pitch ranges. A separately purchased storm collar is required for a complete termination. This DirectVent Pro DSA Flashing is for both metal and tile roofs, and is constructed with malleable dead soft aluminum. This flashing by Dura-Vent is compatible with all DirectVent Pro venting products and fits pipes with a 6 5/8 in. outer diameter, and a 4 in. inner diameter. The flashing can be formed to fit the shape of any roof, which makes installing this weather barrier quick and easy Dura-Vent is well known in the hearth and fireplace industry for producing reliable and cost effective chimney relining components. DirectVent Pro guarantees that you will have maximum weather protection with this vent pipe storm collar. This seal, compatible with Direct Vent Pro venting products, is approved for use with most direct vent appliances and will protect your vent from any potential rain damage. Well known for its reliable and cost-effective products, Dura-Vent offers a limited lifetime warranty for this storm collar. With this high-quality storm collar you know that you are receiving a reliable product at a reasonable price. Sometimes the weather proves to be a more damaging commodity that the animals of your neighborhood when it comes to the wear and tear that your fireplace has to go through on a regular basis. In order to cut out the role that the weather has in deteriorating your fireplace, the Dura-Vent DirectVent Pro Vertical Aluminum High-Wind Vent Rain Cap has been designed to improve the efficiency and durability of Vent Pipes with a 4 inch inner diameter, leaving you with a unit that is very efficient and effective. Good weather protection is a critical component to the long-term successful performance of your venting system. It has been constructed out of a durable aluminum and comes with a limited lifetime warranty. Simple elements like this rain cap can provide just that defense you need, keeping things like rain, snow, or general moisture from damaging your DirectVent terminations. You can use this rain cap with any DirectVent Pro vertical through-the-wall installations on vent pipes with an inner diameter of 4 inches. . 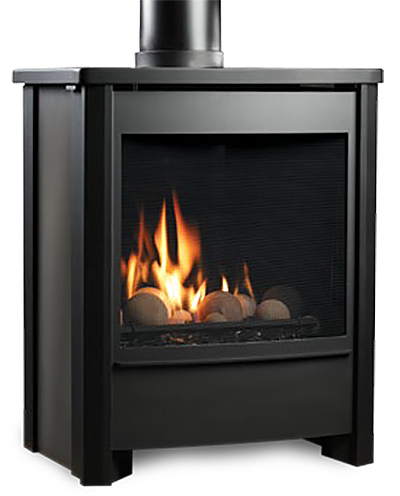 The Kingsman Free Standing Direct Vent Gas Stove with Millivolt Control is a fantastic modern and sleek looking stove choice for your home. 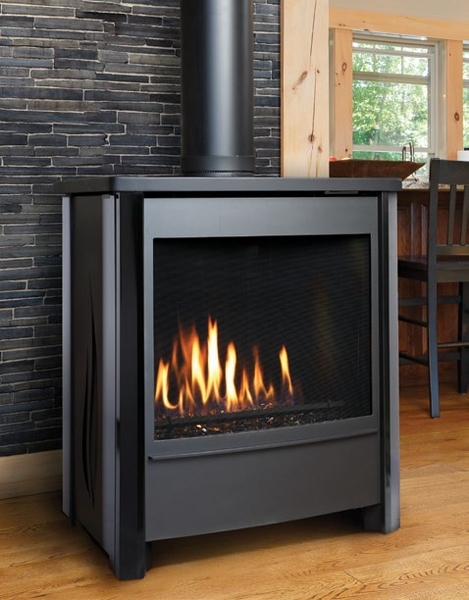 With a reliable standing pilot valve allowing for operation during power outages and the ability to pair with a full line of remotes or wall switches, this stove is a star. Additionally, with a multitude of options in both finishes and doors, as well as your choice of traditional oak logs or contemporary glass media, you are sure to find a set up that matches your design. This stove's compact chassis design can fit into a variety of installations, and it comes with safety barrier screens to help protect your loved ones from contact with hot surfaces. Efficiency Rating: 70.53% Natural Gas / 70.12% Liquid Propane. BTU Input Ratings: 34,500 Natural Gas / 31,000 Liquid Propane. What size room does this unit heat? It can heat between 750 SF and 1500 square feet depending on insulation and other factors. Do the sides of this unit get hot to where it can't be touched ? The sides of the stove will indeed get hot enough to not touch when it is operation. What size flue does this need? This stove may only be vented with Kingsman-specific venting components which would have a 4" inner diameter x 7" outer diameter, or adapted for use with Simpson DuraVent DirectVent Pro pipe which has a 4" inner x 6 5/8" outer diameter. Does the top of the stove get hot enough to boil water or heat soup? Only wood burning stove surfaces will reach these temperatures.